(NaturalNews) As things get ever crazier in the world, there are more reasons than ever to grow at least some of your own food. 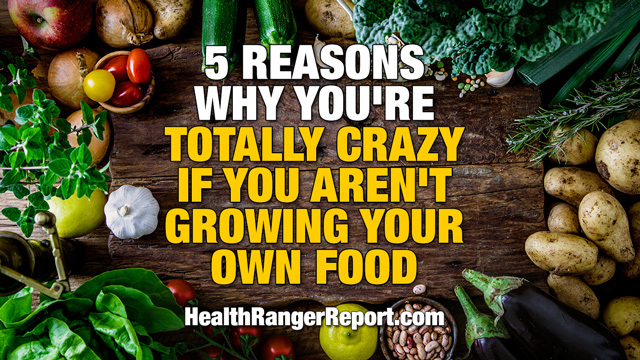 In fact, I say you're crazy if you don't grow some of your own food! Here are five huge reasons to back that up... or listen to my full podcast at HealthRangerReport.com. Growing food costs almost nothing in terms of actual dollars -- it's the labor input that represents the greatest input cost. But with container gardening, square foot gardening, simple hydroponics systems and even countertop sprouting, growing your own food doesn't have to be a labor-intensive activity. You don't even need dirt or a yard to do simple things like grow window sill herbs or countertop sprouts (alfalfa, mung bean, chickpeas, clover, broccoli, etc.). It's true: Growing your own food saves you money today and tomorrow. The end of cheap, easy water is upon us. Thanks to extreme weather events and runaway drought conditions in food-producing states like California, underground water aquifers are being rapidly pumped dry. The end game of all this isn't difficult to see: Today's food-producing meccas will become tomorrow's Dust Bowl regions. Without cheap water, there is no cheap food. And as water becomes increasingly scarce, food will become increasingly expensive, vastly outpacing the average price inflation rate for other product categories. In addition to water scarcity, modern mechanized monoculture (chemical agriculture) also destroys soils, rivers, trees and healthful microbes. There is no long term sustainability of modern agricultural practices, which are focused on "poison and pillage for profit" rather than growing nutritious food to nurture a civilization into a better future. The era of scarce, expensive food has already begun. You're witnessing its beginnings right now, and as the march of human agricultural destruction accelerates, it's only going to accelerate. Stated plainly, nearly all the food you buy at the grocery store is little more than a mere shadow of real food. The processed, packaged food provides empty calories and little else. Dairy products are all homogenized and pasteurized, and even the fresh produce that claims to be "ripened on the vine" was actually cut from the plant -- with the vine still attached -- weeks before it reached its peak nutritional potency. Even more, the soils in which these foods are grown are nutritionally depleted and utterly lacking any real quantities of trace minerals. When you buy food or produce at the grocery store, you're mostly buying the illusion of food -- which is also why you're always hungry for more of it. It's never satisfying because it doesn't provide the real nutrition your body craves. When you grow your own food in nutrient-rich soils, you are producing the world's healthiest foods and medicines. Every edible plant in the world naturally synthesizes its own medicines to keep itself alive (and free from infections). These medicines are at their peak when you harvest vegetables, fruits and herbs after they achieve full readiness... and that's something grocery stores can never achieve because they have to pick everything prematurely to account for transportation and distribution time. In terms of minerals, phytonutrients and natural medicines, home-grown food is the world's best source for nutrients. That's why home-grown fruits and veggies also taste better -- your tongue is telling you the truth about real food! You probably already know our world is headed for some extraordinary challenges ahead. Political strife, social chaos, weather radicalization and even prospects of war are all very real risks throughout the world. When regions are destabilized, food supplies are almost immediately wiped out. Having the ability to grow your own food provides protection from the unexpected. While riots or war can wreak havoc on supplies of traditional grocery store foods, they usually have no effect at all on home gardens and a home food supply. Even better, if you've practiced the skills of growing food, harvesting food, saving seeds and nurturing healthy soils, those skills are immediately applicable no matter what scenario comes your way. Ask yourself this question: If the food trucks stop delivering to the grocery stores, would you rather find yourself standing in a government food line, or popping open a jar of home-canned salsa that you grew yourself? Care to guess which food is healthier? The real danger of being entirely dependent on government for emergency food supplies is that you will simultaneously have to obey the government's demands. Depending on the circumstances, those demands might include giving up your tools of self defense, surrendering your personal property or even abandoning your own home and being relocated to a refugee camp of some sort. In the days of ancient Rome, raiding forces are rumored to sometimes punish a conquered land by plowing the soils with salt, destroying the ability of that land to produce food. This would make the conquered region beholden to the victor for food. He who controls the food controls the people. Growing your own food is one of the greatest expressions of freedom and liberty. This is precisely why governments across the United States frequently seek to criminalize those who engage in home gardening, small-scale farming or raw milk production. Julie Bass of Oak Park, Michigan, for example, was threatened with jail time for growing vegetables in her front yard. Read about my interview with Julie Bass at this Natural News article. Similarly, in 2012 the government of Tulsa, Oklahoma deliberately destroyed the herbal garden of a woman named Denise Morrison. Their goal? To make sure private citizens cannot independently produce their own food and natural medicine. ...the Harte family of Leawood, Kansas, was literally held hostage at gunpoint by law enforcement goons who ravaged their house and tore apart hydroponic growing equipment that they falsely believed to be part of a nonexistent marijuana grow operation in the family's basement. Just this year, another SWAT-style police raid on a home garden was conducted in Georgia, where law enforcement officers are too stupid to know the difference between okra and marijuana. In a televised interview, Georgia State Patrol Capt. Kermit Stoke literally said on camera: "We've not been able to identify it as of yet. But it did have quite a number of characteristics that were similar to a cannabis plant." One of the red flags of knowing you're living in a police state tyranny, in fact, is when the government criminalizes home gardens and conducts armed raids on vegetable growers. That day has already arrived in America, where being arrested as a "criminal" only requires that you attempt to grow your own nutritious garden vegetables.